This was a good date night for my husband and I. I had the lobster ravioli and he had spaghetti and meatballs. My food was delicious, but he said his had too many tomatoes (not the restaurant's fault he doesn't like them, though). The service was quick and friendly as well. My only complaint would be that it is a tad expensive and that there was a loud party seated next to us. There was nice decorations on the walls and tables, but the service wasn’t so great. Our waitress wasn’t giving any type of customer service and all the other workers that we asked for help, just gave us attitudes. If we asked our waitress for help or an explanation of something, then she acted as if she didn’t care. The food wasn’t great at all and I even received dirty rolled up utensils. Old food and grease stuck to the forks. We enjoy dining at Bravo or order take out often. We went there with some family member and they were pleased too. Our server Kathleen was superb and food was great as always! Our party was 11 people and everything went perfectly. We had 2 servers and they were prompt, kept drinks refilled, kept checking on our needs and were always responsive with requests. 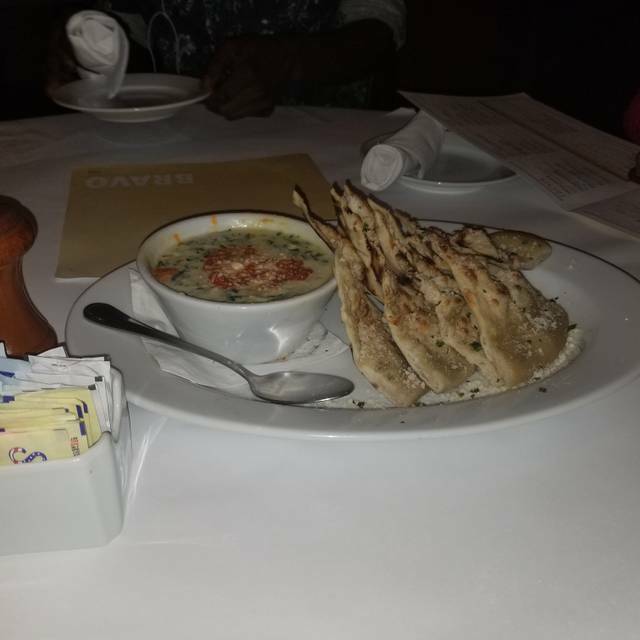 Every time I've visited Bravo, my experience have always been great! From the friendly staff/service; delicious and appealing dishes, cocktails and cleanliness of the restaurant is always A+. Attentive service, reasonable prices, pleasant surroundings. I keep coming back andrevommending to others. My friend and I ordered the pork chop. It was tender, moist, succulent and flavorful. Dietary restrictions were accommodated without any question. 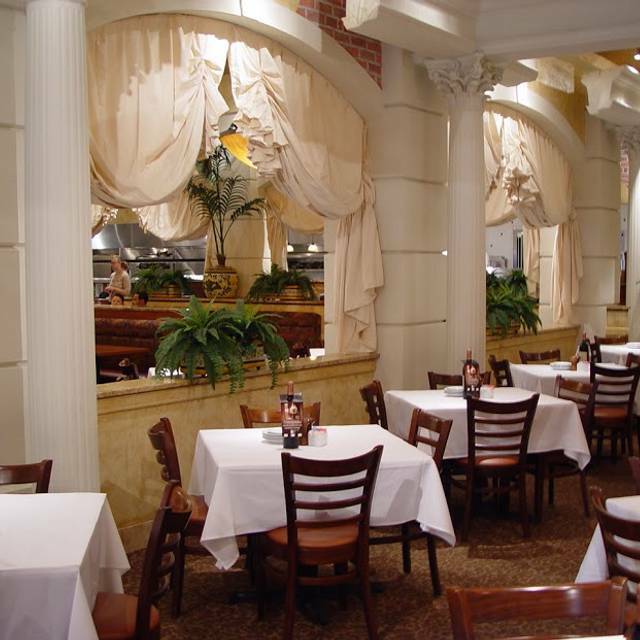 I love Bravo Cucina for work lunches, because it's a quiet place to go (especially at noon-time) and the food and service are always reliable. I also love going with friends for dinner and drinks... and with my family for Sunday brunch. I guess I'm a fan. The spaghetti pomodoro was delicious! although I had made the reservation for 7, the table was set for 6. then instead of moving us to a table that seats 7, another setting was added to table that was too small. Eventually, we were seated at larger table. service and food were very good. We came in for their Special Get a Free Shrimp Napoli with the purchase of a Grilled Salmon entree. 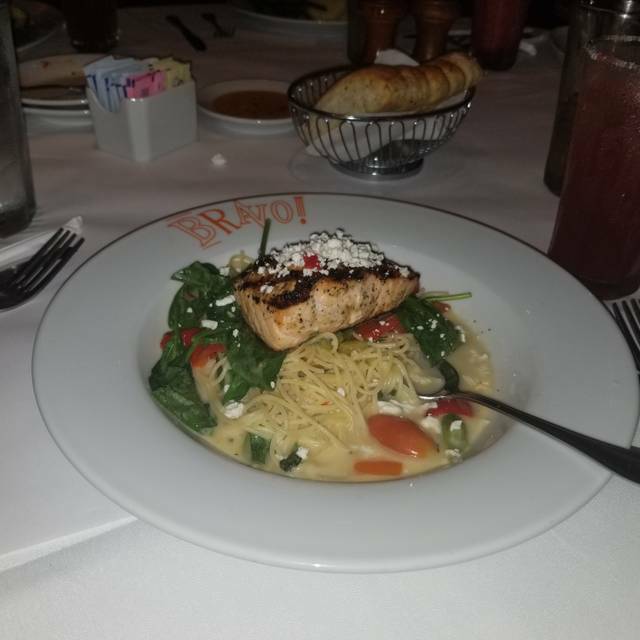 We ordered the Shrimp Napoli, my wife ordered the Grilled Salmon and I ordered a Spaghetti (Capellini) well done with Red Sauce. The Shrimp came in short order and was good (and rich). We waited after the Shrimp was finished for about 15 to 20 minutes for the Entree's. When her Salmon came it was plentiful and delicious but my Capellini Spaghetti was sparse and only had square cut pieces of Tomatoes on the top and a lots of water almost floating the pasta. Not a Sauce that I have ever seen on Pasta. I was expecting something with a thick liquidized Tomato base on the Pasta. Very disappointed with my Entree but I did not complain. Fantastic!!! Oh my goodness. Best Italian restaurant ever. Justin, our server was phenomenal. Skip this place and go elsewhere. 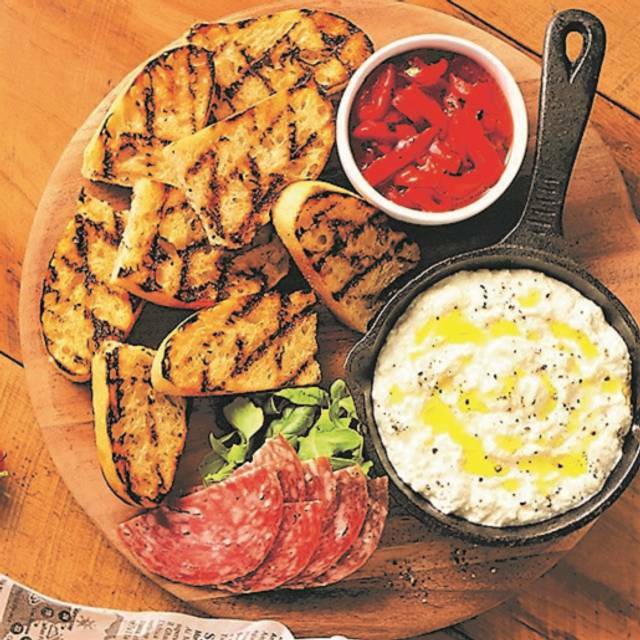 It tastes like broker food and not fresh, premise-prepared Italian. Food and service was excellent. Every time I visit the restaurant everything is always great. We had a great time. The food was ok but not a wow. Appetizers were good too. Now, if you talk about their desserts... They were unbelievable. The price was fair. The ambience was nice but after a while the music got a little bit louder and mix with all the people was kind of loud. The only thing that I didn't was we were seating at the entrance and everytime people open the doors it was freezing for us and the food. Phenomenal service. Mediocre food. Our calamari appetizer was greasy, and the aioli dipping sauce was just garlic in mayonnaise. Nothing special. The marinara tasted like it came out of a jar. 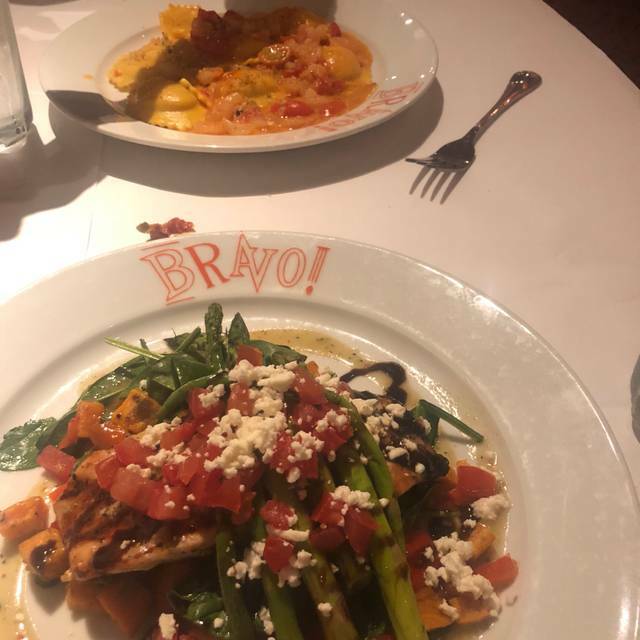 Our friends, who recommended Bravo, apologized after the meal. Apparently these restaurants recently changed hands, which resulted in a new menu. A great birthday dinner!! The service and food was excellent!! Everything was great. I have been there numerous times. I had a reservation at 6:45 and was not seated until almost 7:30, Bravo's quote times where way off. It looked like there was only one front of the house manager on duty and the host area really needed one. The server took our drink order, it arrived in three different stages, and the beer that I ordered took about 8 minutes to get. The server just dropped the bottle in front of me with no glass and turned to another table immediately. When our food arrived the server asked if we world like fresh grated cheese on our item, when he started to grind the cheeses went all over the table and my lap. There was no apology nor clean up. 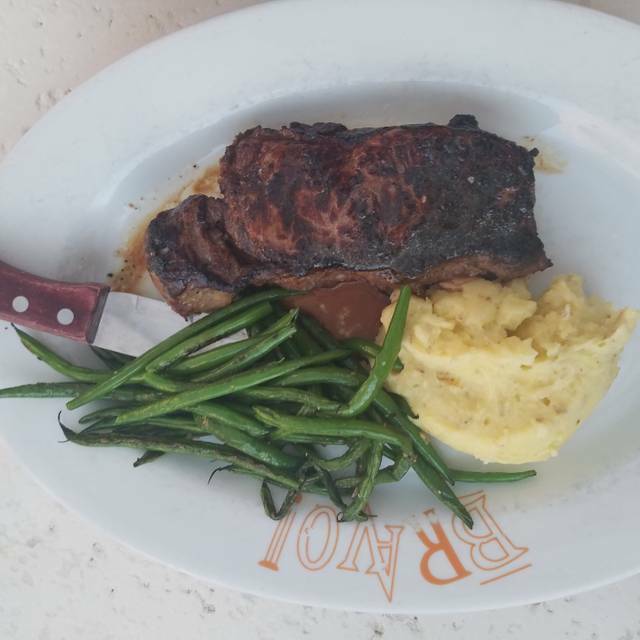 He asked my son to cut into his steak for a temperature check and as he was doing so, the server was already talking with another table. The restrooms where certainly in need of cleaning, with water and towels on the floor. Over all it was OK, a little too busy for their own good and certainly could have been staffed better. it was overall good, just the wait to be seated was 35 mins after our reservation. Our server seemed a bit disconnected and was lacking experience. 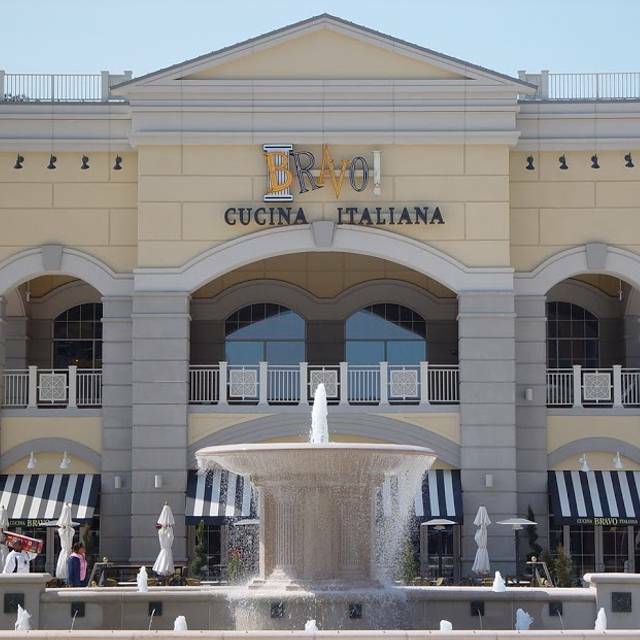 Bravo is a good option in Town Center especially when there is an event at Sandler Center or the Z. A nice menu with a variety of options. We started with the Shrimp Napoli which as always is excellent. My wife ordered the Salmon and it too was excellent, I ordered the veal parmigiana. It was less than expected. The veal was pounded so thin that the piece I had was only a "smell' between the breading. The angel hair pasta was sub-par. The pasta should have been linguini which would have complemented the veal (what little there was. Overall, we have been patrons of Bravo since it's opening. I would not let this singular shortfall prevent me from returning. We often bring our entire family (14-members) for a celebration twice a year and all enjoy. Food was scrumptious and service impeccable. In the heart of city center with convenient parking options. We came to Bravo to celebrate my husband’s birthday and we were not disappointed. Our party of 5 was seated immediately. Our waiter was very professional, courteous and had a great memory. All of our dinners were hot and as ordered. So far, this is the best Italian restaurant I have found in Virginia Beach. We will definitely return for more fantastic Italian meals. Our server was awesome! We give her hard time and still made us feel welcome. On top of that she was so much fun! Great birthday dinner for the group! Food was delicious, seating was prompt. Our waiter gave my mom the VIP treatment for her birthday. And he is quite good looking too, so that made for a nice evening a well. Clean restaurant. Good food. Excellent service by John D. Never felt rushed, and food and drinks arrived at perfect times. The food was delicious, our waiter was on top of everything. The atmosphere was great. Prices were reasonable for what you got. Would recommend for any occasion. Definitely will go back when I’m in the mood for Italian. Gluten free options (even though there were only a few) are still a plus for me.